Mobi-Mat® Trademark - Mobi-Mat by DMS Inc. The USPTO has given the MOBI-MAT trademark serial number of 79005387. The current status of the trademark MOBI-MAT® is ‘registered’. Protecting and enhancing our county’s environment and its sustainability is one of the greatest challenges we face, and potentially one of our greatest opportunities. In the future, counties that thrive are likely to be those that adapt to a low carbon, more efficient world. Current and in-development Mobi-mat® RecPath™ are being designed to lower our environmental impact and contain 100% sustainable materials such as high-performance polyesters formed from recycled water bottles. Our mission is to make the cheap plastic mats obsolete and the 100% recycled polyester and soon biodegradable polyester the norm! In addition to recycling everything that can be recycled, Deschamps Mat Systems Inc. thinks green on a day to day basis and has become an ISO 14 001 certified company. Mobi-Mat® RecPath™ is an ADA Beach Access Mat and the most non-slip portable roll-up ADA pathway for pedestrians, wheelchair users, strollers, bicycles and ATVs compliant with the Americans with Disabilities Act of 1990 (ADA) and the Architectural Barriers Act of 1968 (ABA). The Mobi-Chair® is a high quality, floating beach wheelchair that provides a seamless transition from boardwalk-to beach-to water. Your message will not be missed, place Mobi-Mat® Ad Mat Panel™, the best outdoor billboard type display, designed for high foot beach traffic, to connect with people on the beach, to direct guests at any event. Mobi-Mat® VMM™, a portable roll out polyester mat, is advised for creating temporary access roads, working platform and accommodating traffic on supporting but unstable grounds like sand, greens and gravels even on light slope. Mobi-Mat® Helipad™ is a lightweight Portable Helicopter Landing Mat that prevents sand clouds and Foreign Object Damage (FOD). Within minutes you can create a stable, permanent or expedient Helicopter landing zone. 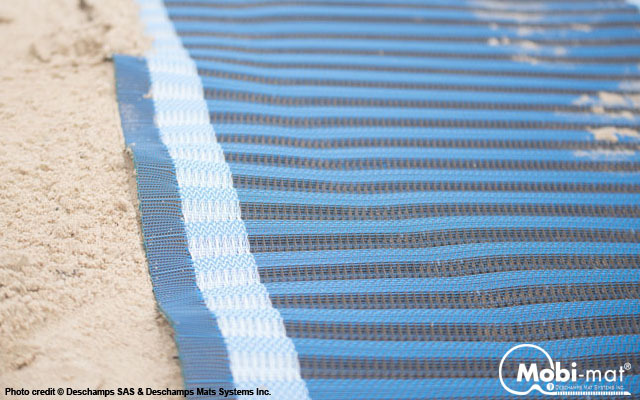 Deschamps Mat Systems Inc. engineers and manufactures the best range of nonslip rollout Mobility Matting & surfacing Material under the registered trademark Mobi-mat® for beach accessibility,. Deschamps’ Mobility Mats are portable roll-up pathways, boat launches and roadways and helicopter landing platforms or parking areas made of high density recycled polyester. Innovative, lightweight and rollable, the MOBI-MAT® pathways are easily installed on any type of level or sloping ground, sand, snow, gravels, grass and slopes to enhance beach safety and accessibility to beaches for disabled people, vehicles and helicopters.